Nico Rosberg definitely has a thing. A habit. Maybe even a party piece. That thing is that just at the very moment we think he's down and out, that his stellar team mate Lewis Hamilton finally has consigned him to his box, he leaps right back into contention. And despite the regularity of this we still every time rather gullibly wander straight for the mental trap. We never learn. His bounce backs still come brim-full of surprise. And you know what? He did that thing he does once again today. 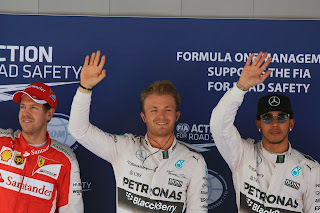 Yes - Nico claimed the pole position for the Spanish Grand Prix tomorrow. 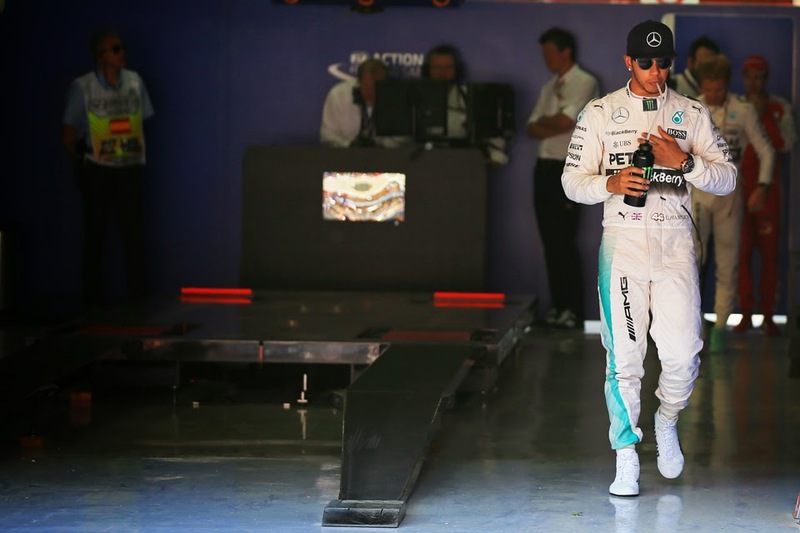 Most headed into the weekend expecting the other Mercedes of Lewis Hamilton to prevail. Before today Nico had yet to start or finish as the first of the Merc pair. Plenty including Paddy Lowe (who should know) spoke of the wonderful virtuous place Lewis had got his driving into. By contrast - and perhaps consequently - many reckoned Nico's challenge was by now broken. But even ahead of today there were clues around of Nico's resurgence if you knew where to look. The Bahrain race last time out at least suggested that his efforts maintained not just a pulse but some spirit too. Niki Lauda for one stated after that round that "Nico is back". That full revelation awaited in the vital Q3. Nico again dipped under his team mate's best, not by as far but the gap was still a relatively gaping quarter of second. And in another thing that Nico does, he did it with ultra smooth, classic, almost ethereal, progress. Not a wheel out of line; not so much as a thread hanging loose. By contrast Lewis was ragged, with his final effort featuring at least one premature step on the gas as well as more than one locked wheel. He didn't improve then on his previous mark and Nico's pole thus was ensured long before he'd completed his own final run. But complete he did nevertheless and while he didn't improve either his second time nevertheless was close to his first, some 0.073 seconds shy, meaning he'd set two times good enough for a fairly comfortable pole position. This was no fluke. Nico too after the event recognised the nick-of-time importance of what he did today: "Of course I needed (this) sooner rather than later that's for sure...it was a good day in the office." Lewis wasn't offering any excuses either: "I generally didn't have the pace today, Nico did a great job and generally I don't think I had the balance where I like it, but I did my best with it". Mercedes non-executive chairman Niki Lauda insisted though this wasn't down to any transformations in Nico: "No, he was trying as hard as always" he said, "but maybe Lewis this time was a little over the edge". Joining the legends of the past commending Nico's effort an observing Jackie Stewart said admiringly: "Nico can do this, a very clean lap, no spectacular nonsense but just very clean". And on the bigger picture JYS continued: "He (Nico) kind of deserves it now, he's been the second man too often almost. It can be very depressing to suddenly be beaten by your team mate in a consistent way which has been happening...and now, if he gets a crack on he can win races." And what of the Ferraris, that many were looking at in the previews as possible Merc beaters? Well if they are to prevail this weekend it won't be on pure pace, as the best the Scuderia could do today was P3 and three-quarters of a second adrift of pole, which was done in Sebastian Vettel's hands. For Kimi Raikkonen it was even worse. After being impeded by what he said was a "freak" of a tyre blanket burning one of his sets of tyres for Q3 he starts seventh on a track not big on overtaking. Worse still, the red cars' greater ability to nurse the Pirelli tyres over a race stint as well as to run its power unit at full charge through a race likely won't save them either, as in yesterday's race simulations the Ferrari was significantly adrift of the Merc too. Indeed it suggested that Seb and Kimi might struggle with the Williams this time also. Seb after qualifying as ever sought to maintain a brave face, but the feeling that he's racing for third at most, barring unusual circumstances, slipped out from behind it: "I think 'disappointed' is the wrong word" he said, "(but) obviously we would have loved to have been a little bit closer". "We still should be in good shape tomorrow, I hope for a good race. But you have to say those two guys are doing a good job..."
Lauda meanwhile in his typical frank summation stated "Ferrari is not as strong as I thought". And perhaps worst of all for the Scuderia while it brought a major and much-vaunted upgrade this weekend it's not at all clear the extent that it worked. Indeed Kimi abandoned many of the new parts for an older spec today. This furthermore more may be even more traumatic than it seems on the face of it, as in a 2015 season so far that has had a lot of the new leaf about it for the Italian team this is rather redolent of one of Ferrari's biggest impediments during its recent years of frustration. That technical upgrades often did not work; sent it down blind alleys; were discarded. No wonder Kimi seemed in a bad mood. So on this basis rather than Seb looking ahead tomorrow he might have to pay some mind this time to Valtteri Bottas starting one place behind. 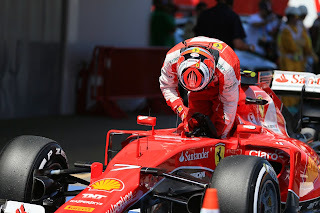 Slightly oddly though his team mate Felipe Massa was a second shy of the Finn on the watch, and he'll start ninth. 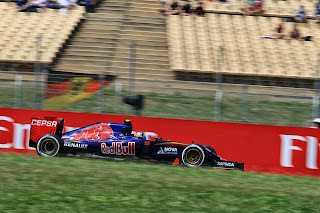 While Toro Rosso has been excellent here, and made good on it with fifth and sixth place starting slots, with home boy Carlos Sainz ahead. Once again too its A team was left trailing, and the Red Bulls only will start eighth and tenth (Daniil Kvyat for once the lead). "Things can change quickly" Lauda reminded us too afterwards, rather sagely. And how small things can make a difference in F1. Had Lewis taken another pole we'd likely be expecting a demonstration run tomorrow. But with Nico ahead instead a fine race seems a distinct prospect. As ever a lot will depend on the long run to turn 1 and the order after the first complex, as Nico noted: "starting in front is a particularly big advantage here". Strategy variation might be limited too, especially with the hard tyre being far slower than the medium. Both Merc pilots too have saved the same number of medium tyre sets. But Nico will be more aware than most that the job is half done, something he acknowledged readily stating that the pole was "just one step in the right direction to winning the race here this weekend". And Lewis concurred, saying "tomorrow still there's a lot to play for". Indeed, in some ways if Nico loses out again to Lewis tomorrow it may be the hardest to take of all - in the spirit that it's not the despair that kills you, it's the hope. Yet it was a completely different spirit that Nico drew on today, and will hope to continue to draw on tomorrow. 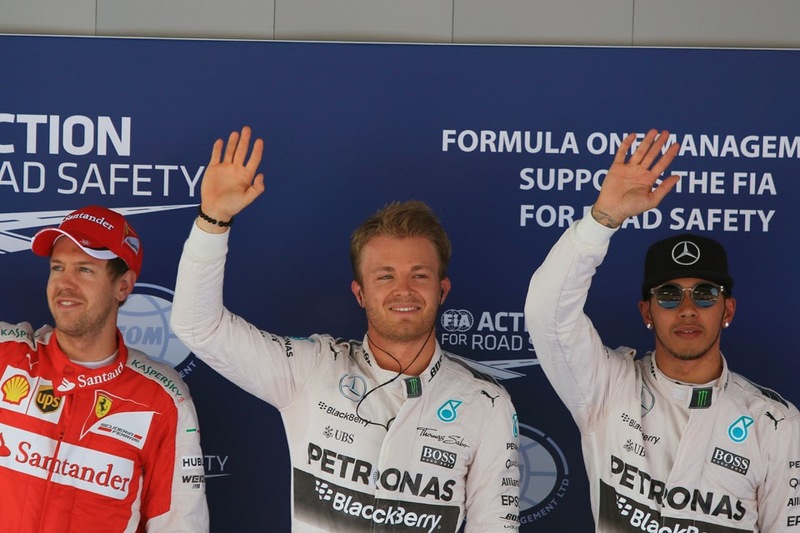 That of Mark Twain, in that reports of Nico Rosberg's F1 death were - once again - greatly exaggerated.